This 6 CD set of standard audio CDs are ideal for playing in your car, portable CD player or home stereo system. 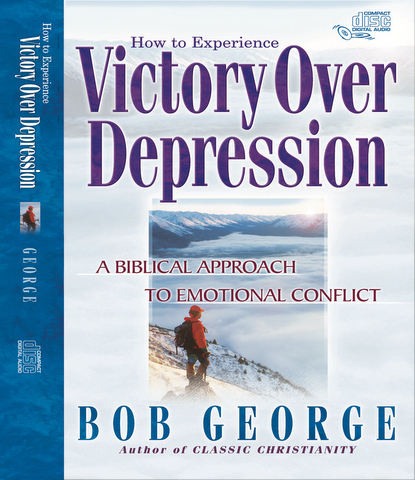 The title, Victory over Depression, is a good title because the concepts taught here cover so much, that a more focused title would not be accurate. This book covers the "Causes of Depression", "How to Get out of Depression", "How to pull out of the downward Spiral of Depression", "How to recognize the beginnings of Depression", "How to live life in a manner as to not even worry about depression", "How to help others who are experiencing Depression". This study is able to give ANY person the tools they need for Victory in the war against Depression WHETHER YOU ARE STRUGGLING WITH DEPRESSION OR NOT. Over the last 20 years I have given out Victory over Depression several times to people in need. One of the most note worthy was my old room mate from college who lives in a different state. He shared with me some things going on with his brother & mom which was shaking his foundations in life. He explained that he was wrestling with desires to end his life. I WAS PREPARED for this conversation thanks to my study of Victory Over Depression years ago (and having taught this to my kids as part of our bible studies after that). I was able to draw upon my understanding of depression and its foundations to get my friend's vision and focus off of the wrong things and onto the right things. I sent him a copy of Victory over Depression and every follow up phone call with him, I begged him to go through the study. Today, my friend is in a 4 year study program for Church deacons, serving Christ as needed. Now, I am not saying that Victory over Depression (PLUS Jesus) were the only things which turned his life around - but they could very well have been. I work with all types of people - Lost & Saved. Sometimes I am the leader, sometimes I am the follower, sometimes I am a peer. With my understanding of Victory over Depression, I am able to interact with Saved and Lost people from both a Christian and secular viewpoint - in all sorts of situations and events. The title of this study could easily be "How to Live a Healthy & Peaceful Life". This simply is the best prescription, not only for people struggling with depression, for all people to understand the worlds philosophy in contrast to Gods truth for our identity. Bob George does an amazing job at helping us keep our focus on Christ. He explains so very well how to control our minds and keep them on the things above.